The slip resistance of floor materials has received considerable attention from safety professionals. This is because every flooring material has advantages and disadvantages, and so must be assessed to ensure its suitability - and then be properly installed and maintained to provide a safe walking surface. As a rule, the slip resistance of a floor material is directly proportionate to the number of microscopic points that project from its surface. Concrete, for example, is a relatively safe surface, but if it is improperly cured when poured, it becomes a very slippery surface. Asphalt tiles and vinyl tiles are relatively safe if the surface treatment chosen is correct. Marble and terrazzo surfaces are inherently slippery and should be treated with a sealer containing a high percentage of solids to increase slip resistance. Floor tiles can be very safe or very dangerous, depending on their factory finish and the standard of maintenance. While there are many types of floor surface, the Slips Assessment Tool (SAT) is a freely downloadable computer software package available from the Health and Safety Executive website. It allows an operator to assess the slip potential of pedestrian walkway surfaces. You can use SAT to gather relevant information concerning floor surface properties, contamination, cleaning regimes or footwear.? You can also obtain an immediate assessment of a slip risk by entering the information into a laptop computer, preloaded with the SAT software on site. The SAT is used in conjunction with a small, portable surface micro-roughness meter, which users must obtain separately. There are a number of commercially available meters, although the Health and Safety Executive does not specifically endorse any of them. A cleaner’s locker is a good place to start an investigation of slip and fall accidents. The safety professional should determine what products are being used and how they are being combined. Are the mops dirty? Do the staff use the same mop for cleaning and disinfecting? How often is the floor finish removed, and what is used to remove it? A floor finish is a product that is put on top of the raw floor material to protect it, to beautify it, or to change its surface characteristics. A floor finish can be used to make an unsafe floor less slippery or can inadvertently be used to make a safe floor dangerous. Finishes can be either synthetic or organic. Acrylic finishes are common. Some companies offer special formulations for problem floor surfaces like terrazzo and marble. One manufacturer makes an acrylic finish that contains aluminium oxide flakes. This finish can be applied in restaurants and other locations where floors are usually wet. These acrylics form a one piece floor surface through interlocking crystallisation when the material dries. Acrylics make safe floor surfaces, but are labour intensive and have to be removed when the product builds up. Improper cleaning methods can complicate matters further. Oil mops treated with petroleum base sprays can turn a safe floor into a hazardous one. Pine-tar disinfectants used on ceramic floors sometimes leave a slippery residue and cause many bathroom falls. The National Safety Council, in America, reports that many slip accidents are caused by improper cleaning methods and recommends that floors are cleaned only with clean water. If soap or commercial strippers are used on a floor, care must be taken that no residue remains when the floor dries. A final finish is sometimes applied to the floor by the pedestrian, who can pick up fertiliser and other chemicals on shoes and bring dangerous adherents into a building. If a victim has been previously injured, is disabled in some other way, or is elderly, we might assume that the physical infirmity caused the accident. But our assumptions can prevent us identifying the real root cause. There is no correct way to stand or walk. What we view as correct posture and movement is often a matter of aesthetics. Disabled people sometimes need to use a high level of conscious intervention in the walking process. Investigators of falls should understand the principles of human movement and have a working knowledge of floor materials, cleaning methods, and lighting. When reconstructing a slip and fall accident investigators should avoid coming to any conclusion too quickly. The victim should be extensively interviewed, and the verbal report used to focus the investigation. The slip resistance of the floor should be measured, and accurate measurements of the light intensity and contrast should be made. In every case, the findings should be compared to national or international building codes and industry standards. Although they are seemingly the simplest of all accidents, falls are anything but. Improving the traction of a slippery floor is one way to reduce slip and fall incidents. Sometimes this can be as simple as changing floor cleaning products. More often, though, it takes a little more effort. Where it is not practical to replace flooring, etching, scoring, grooving, brushing, appliqués, coatings and other such techniques can be used to improve slip resistance. For concrete floors in work areas, non slip paints can be applied to increase traction. These paints are available in many different grades and colours and can be used not only in walking areas, but also on ramps, in loading areas, and in areas where harsh chemicals are handled. Most are also formulated to be easy to clean with common cleaning equipment, such as mops and floor scrubbers. After coatings or finishes have been installed or applied, cleaning plays a major role in determining whetheror not the floor will maintain its desired properties. No finish will last forever, but improper cleaning lessens the life span of even the toughest floor preparations. Using the wrong detergent, using too much detergent or using dirty mops can also contribute to less than desirable results. When in doubt, contact the manufacturer of the floor preparation for cleaning recommendations. In addition, see what the manufacturer of the cleaning chemicals recommends. Both sources should be able to provide valuable insight into maximising your floor investment. 1. Mark aisles and passageways - use tape to mark out all fork lift areas or loading bays. 2. Provide traction on slippery surfaces. Weather conditions can cause sudden, unexpected slipperiness. Ensure all your workers have suitable footwear with the correct type of sole. Use warning signs to alert workers to any problem. Anti skid tapes and doormats, securely fastened, should be used. 3. Improve safety on stairs - tread markers and warning signs should be used. 4. Mark Emergency Evacuation routes - these need to be clearly marked, visible and familiar to all staff. 5. Safety signage and labeling - mark clearly any areas where forklifts might be present. 6. Warn of temporary hazard - immediately alert staff to any spills or uneven floor surfaces by erecting warning signs. 7. Spill control - having a spill kit located in any area with potential for spillage that can be instantly accessed is sensible. Look at preventing substances such as oil, chemicals or other materials reaching the floor by using catch trays. A dry floor is the safest option. Ensure the correct absorbent is used for the materials spilled or the situation can be made even worse. 8. Train employees - sounds obvious, but make your staff aware of the importance of good housekeeping: not leaving equipment around, alerting colleagues to spillages or cordoning off a slippery area, and always replacing items to their designated storage space. The revised BS 5499-1 is to improve the technical representation of safety signs and introduces the following key principle: it recommends the use of upper and lower case lettering. Visually impaired people read and understand sentences or single word messages with an initial case letter more clearly, e.g. Warning or Fire Exit. In Great Britain, the Health and Safety (Safety Signs and Signals) Regulations 1996, put into practice the European Safety Signs Directive (92/58/EEC), designed to standardise safety signs and so reduce the risk of misunderstandings from language and literacy problems across the whole European community. Most slip, trip, and fall accidents are preventable. OSHA says that many slips, trips and falls are caused by ice, wet spots, grease, polished floors, loose flooring or carpeting, uneven walking surfaces, clutter, electrical cords, open desk drawers and filing cabinets, and damaged ladder steps. The controls needed to prevent these hazards are usually obvious, but too often ignored. They include keeping walkways and stairs clear of scrap and debris; coiling up extension cords, lines, and hoses when not in use; keeping electrical and other wires out of the way; wearing lug soles in icy weather; clearing parking lots, stairs, and walkways in snowy weather and using salt or sand as needed. As a minimum, OSHA recommends that all areas where employees work or travel must be kept clear of hazards. Every floor, work area and passageway must be kept free from protruding nails, splinters, holes, or loose boards. These surfaces must be clean and free of hazards that could interfere with normal activities. What causes slips and trips? According to HSE, slip and trip accidents can happen for a number of reasons, but all too frequently we jump to conclusions about why they happen rather than really looking for the true cause, or we decide that it is just one of those things and do nothing. The following should help you to understand what causes a slip or trip and give you some ideas on what you can do to stop accidents from happening again. What you may find is that there are a number of options open to you that are quite straightforward and relatively easy to implement. Most floors only become slippery once they become contaminated. 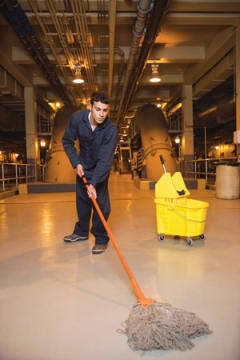 Prevent contamination and you reduce or even eliminate the slip risk. Contamination can be classed as anything that ends up on a floor e.g. rainwater, oil, grease, cardboard, product wrapping or dust - the list is endless. It can be a by-product of a work process or be due to adverse weather conditions. If product ends up on the floor it is costing the company money. • If not, can the contamination be controlled using drip trays for leaks, lids on cups and containers, good sized mats at building entrances to dry feet? If you can’t stop contamination from getting onto a floor you will need to ensure that it is cleaned effectively and quickly. Half of all trip accidents are caused by bad housekeeping, so improving this would eliminate a large number of accidents. • Ensure there is a suitable walkway through the workplace • Keep it clear of trailing wires and obstructions • Look at people’s workstations; are the floors tidy, do they have enough storage space? • What about other rooms? Are they tidy, are goods suitably stored, are there enough bins? Good housekeeping doesn’t cost money, it just takes a little personal effort. Do all staff at your workplace - workers, managers, cleaners or maintenance technicians - have a ‘see it, sort it’ attitude? A large aluminium foundry in Japan identified slips and trips as being a significant risk to employees. This was mainly due to poor housekeeping and poorly maintained machinery leaking substances on to the floor. Realising the scale of the problem the company set about implementing a programme of cost effective improvements based on a Japanese system of workplace controls. The size of the premises meant that improving housekeeping would not be an easy task. However, the company was able to make substantial improvements by implementing the ‘5S Philosophy’. The system is based on five Japanese words which when translated mean Sort, Set in order, Shine, Standardise and Sustain. Once implemented, the system aims to eliminate unnecessary items from the workplace, improve order and tidiness (making sure everything has a home), maintain a clean workplace, ensuring that a workable system is in place and that these improvements are sustained. In addition to the obvious improvements in housekeeping, savings were also made as fewer items were lost. Obsolete equipment was more likely to be discarded, thus increasing storage capacity. In addition, the company reduced slipping and tripping hazards by removing trailing cables, demarcating pedestrian routes, introducing non slip surfaces and reducing walkway contamination at source. The company has been using the 5S system as part of a Total Productive Maintenance system and this has evolved over the past eight years. Although it has been difficult to quantify, the benefits of using 5S are apparent. Clutter is removed, tripping hazards are eliminated and the risk of slipping reduced. Plant and equipment are cleaner. Maintenance problems can be identified at an earlier stage, thus reducing production downtime due to mechanical breakdown. Tools and equipment are placed in an ergonomic position to help reduce strains and fatigue. Duplication is avoided as every team takes responsibility for its own equipment, thus making savings by not purchasing or keeping excess equipment. The operation gives the impression that everything is under control and this has a good impact on employees, customers and visitors. Everybody takes responsibility for the cleanliness of their work area so there is no need for a special clean before major visits. It is clear that by successfully implementing better standards of control over the workplace the risks of slipping, tripping and falling can be reduced. Other noticeable benefits include financial savings made by improving maintenance and reducing production downtime from working days lost due to accidents. This company also reported an increase in morale and consequently productivity, as it was clear that employees appreciated the improvements made to their work environment. How people act and behave in their work environments can affect slips and trips. • What tasks are taking place? Can they be improved? Can a worker carry fewer or smaller boxes to see route ahead more clearly? Environmental issues can increase the risk of, or prevent slips and trips, so it is important to take them into consideration. But firstly, what does the term ‘environment’ mean with regard to slips and trips? It means lighting - natural or otherwise - loud or unfamiliar noises, the weather, humidity or condensation. Footwear can play an important part in preventing slips and trips. For work situations where you have some control over footwear, but where floors are mainly clean and dry, a sensible footwear policy can help reduce risks. For preventing slips and trips sensible means: flat, with a sensible heel, with the sole and heel made in a softer material that provides some grip. Where the floor is uneven, such as on a construction site, then a boot is preferable to a shoe since it provides additional ankle support. In work situations where floors can’t be kept dry or clean e.g. food preparation, the right footwear will be especially important, so a slip resistant shoe may be required. BSS help clients identify skills gaps in their workforce and then develop and deliver bespoke training programmes to meet these gaps, to improve safety awareness and performance in the workplace. BSS have been successfully providing these services to companies throughout the world for almost 20 years. BSS now have offices in Qatar, Dubai, Yemen, China, Libya and Algeria. With a team of specialist staff grounded in a detailed understanding of each country’s cultural issues, as well as specific industry and country safety requirements. Instructors are all qualified to NEBOSH standards and have a minimum of 15 years’ experience.